Bet that Shackleton and Amundsen would never have dreamed of this. Fly the Drake and cruise Antarctica. 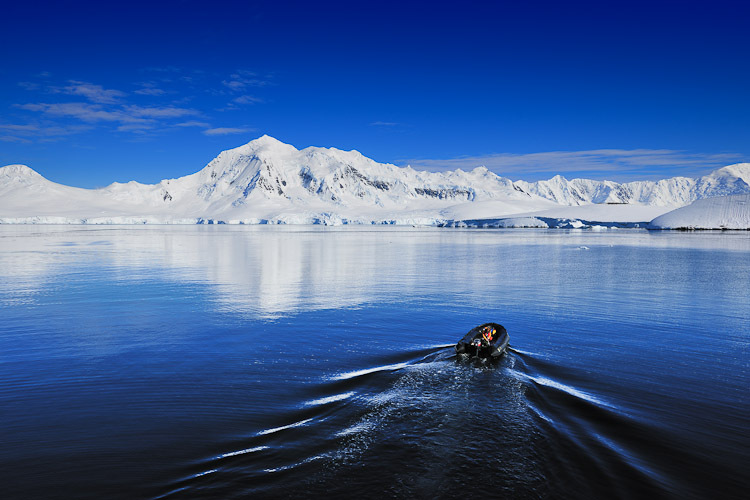 Yes you heard it right, skip the feared Drake Passage and go directly to the White Continent. 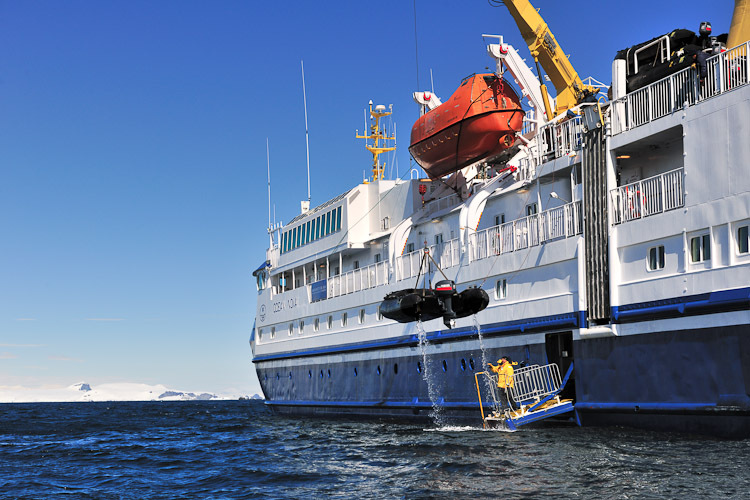 Until recently, only scientists and researchers used the back door to get into Antarctica. Not by ship, but flying from Chile. 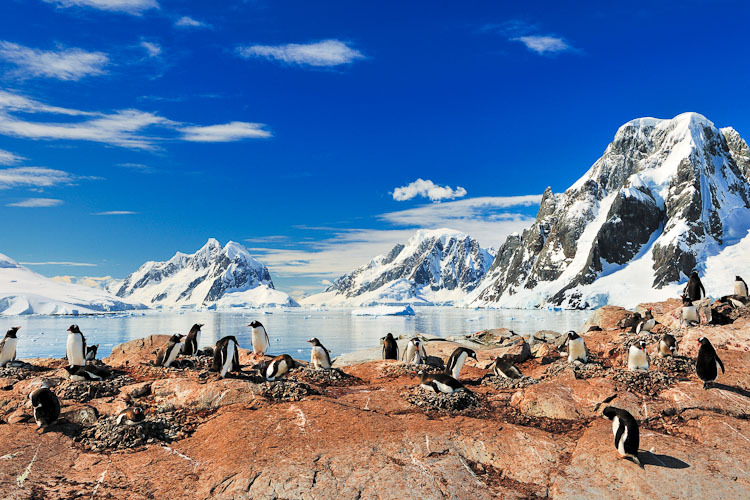 Why sail across the Drake if in just three hours you can be standing with both feet on the Last Continent, safe and well.No fifteen metres high waves that make the stretch of ocean between the tip of South America and the Antarctic Peninsula so notorious. Flying also means being completely ready and full of energy to discover this extreme part of Earth. 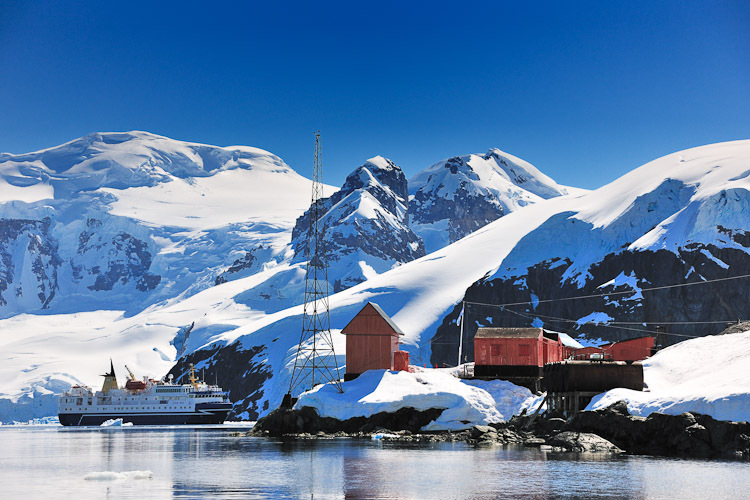 In 2001, a clever Chilean company came up with the idea of creating an air bridge during the summer months between Punta Arenas, the southernmost town in Chilean Patagonia, and the Antarctic Peninsula. Not only for biologists, oceanologists and weather scientists but also for the ordinary tourist. 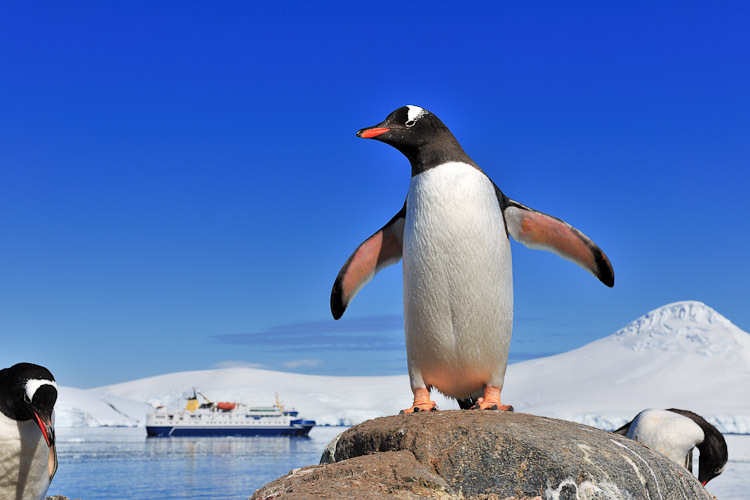 So image: no Drake Passage, no 19-day Antarctica sailing itinerary that only travellers with oceans of time can afford. No lost days at sea. 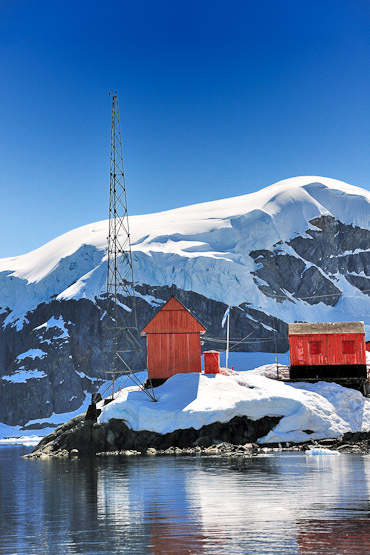 But Antarctica in a compact way: a fantastic, adrenaline-filled six days aboard a small expedition ship, without crossing the Drake. If you ever dreamed of flying those legendary, rusty Russian cargo planes, you will be in for a disappointment. No Russian steel crate with a glass nose and a semi-drunk, bearded pilot behind the wheel. 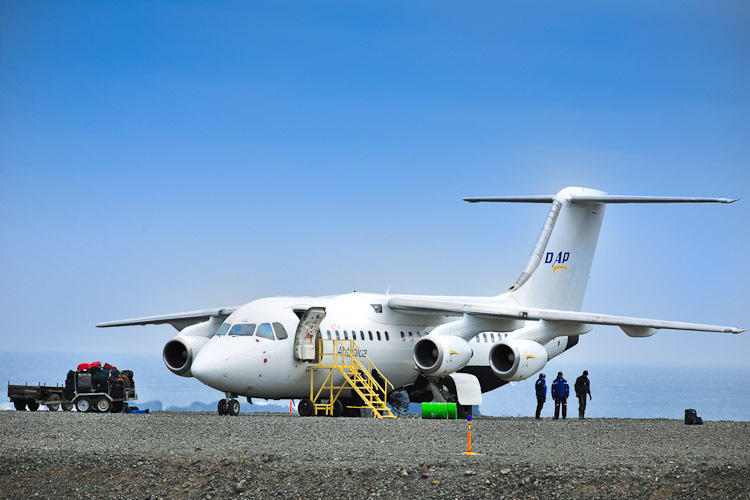 The BAE-146 built by British Aerospace looks pretty neutral, except that “Antarctica” is painted on its fuselage. A comfortable 3 hours later we land on King George Island, where Chile’s Eduardo Frei base is situated. Not on ice but on an ordinary gravel airstrip, which in the most extreme occasions is covered with dry snow. Technically, this is not the Antarctic Peninsula but the Southern Shetland Islands. In the distance floats the Ocean Nova, our expedition ship for the next six days. Purpose built in Denmark to smoothly conquer icy seas, this is no ultra-deluxe ship, but a very comfortable home for up to 68 people. Many other ships can take more than 200 people on board but that makes things more complicated in Antarctica. A short Zodiac ride from King George and we’re in the observation lounge of the Ocean Nova. 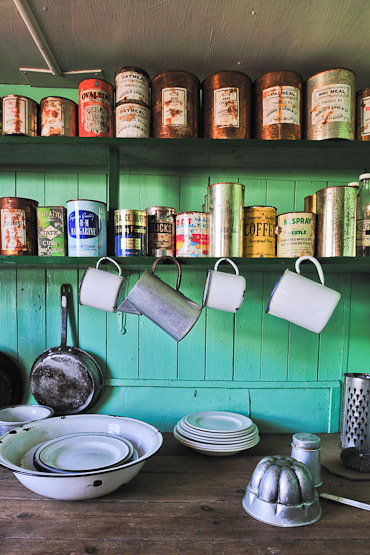 A warming drink, a beaming 12-strong expedition team and the prospect of seeing and doing things we have never experienced before. The Ocean Nova team is not low calibre. A couple of seasoned biologists, young naturalists, a historian, an ornithologist, an ocean specialist, a doctor and other crew members who have sailed Arctic and Antarctic waters for many years. Some even worked on Russian nuclear ships and have plenty of stories to tell. They are the perfect entertainment and companionship for when having a drink at the bar. Did we mention already it’s an open bar? A glance through the cabin porthole and you know enough: a sunny, early morning overlooking Mikkelsen Harbour on Trinity Island where we will soon make a landing. The strong rubber Zodiacs can take eight to ten passengers. Life jacket on, sunscreen and sunglasses and cameras at the ready. Several Weddell seals lie sunbathing in the snow and a leopard seal circles around the Zodiacs then disappears. “Dangerous animals,” smirks a biologist. 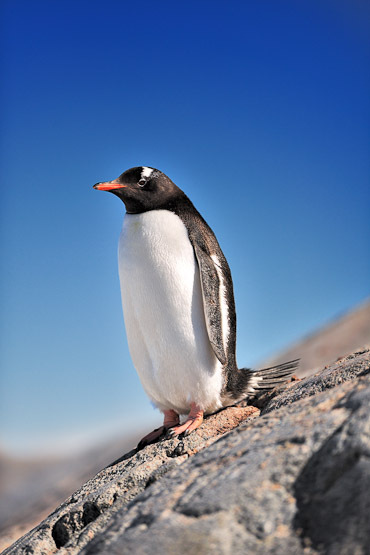 “It’s known that they can bite straight through a Zodiac.” Further up near the old whaling station sit a flock of cackling Gentoo penguins. 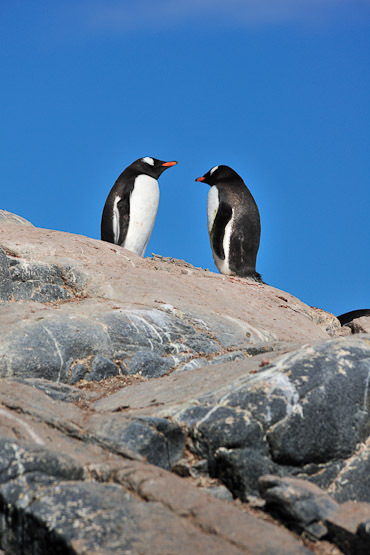 “Never block the way of a penguin,” Mariano, the expedition leader explains. “Penguins always have right of way. 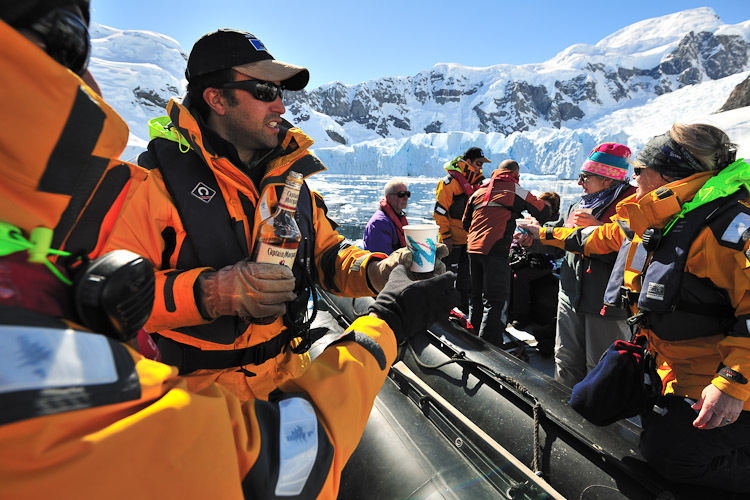 No matter what!” In the afternoon, after hours of sailing through a sensational silent white landscape and a hearty lunch, there is a Zodiac trip between icebergs and ice floes in Cierva Cove. 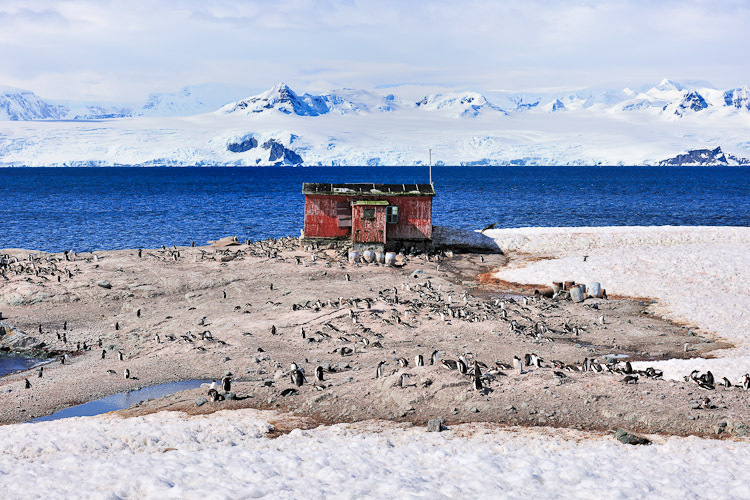 The location is the south side of Cape Herschel in Hughes Bay along the Antarctic Peninsula. We glimpse the Argentine research station Primavera in the distance, while close to our Zodiac we see crab eater seals, penguins, and skua birds… Slaloming with the Zodiac between sculptured icebergs you can listen to almost supernatural sounds: the ice releasing millions of years-old air. In the far distance icebergs are breaking off glaciers, and a little closer an iceberg is tipping over… The trip doesn’t end here and will take us to famous spots on the White Continent like Livingston Island, Port Lockroy, Petermann Island, Paradise Bay, Cuverville and Deception Islands. The target of this trip will be the crossing of the Lemaire Channel and latitude 65° South. The highlight for us? A South-American BBQ on the deck of the Ocean Nova while the sun is barely setting behind the blue and pinkish frozen horizon and giant ice pieces are floating by the ship. 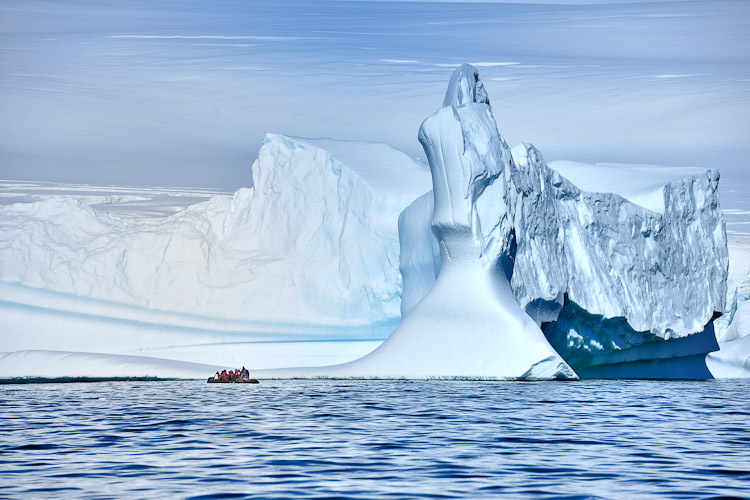 Antarctica XXI is the ultimate way to see the White Continent in a more intense way. The trip is shorter but better and the dedication of expedition team is infectious. 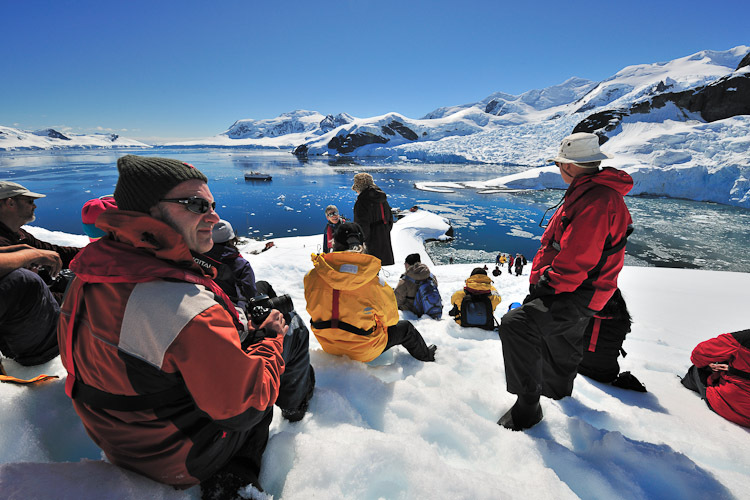 Travelling with a small group in Antarctica means more landings and time ashore. 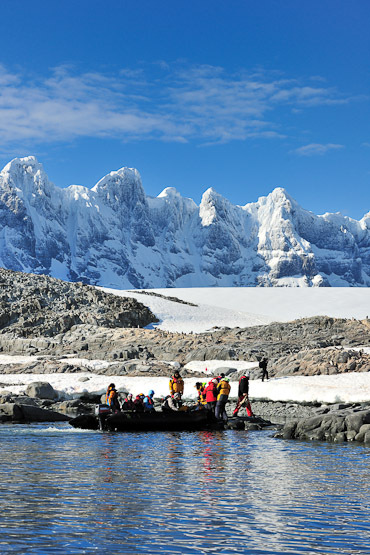 A trip with Antarctica XXI starts at 9.260 US dollars. Included in this price: Flights according to the itinerary, cruise in full board plus all drinks, excursions and lectures, transfers and if needed accommodation on land. Good to know is that due the limited availability the trips sell out fast, so if you want to do this in the season 2012-2013, it is best to book now! We loved the trip, even while there is big room for improvement on the Chilean pre-&post- travel ground control side (but we heard rumours they are working on it). The most important thing: big thumbs up for the expedition team of the Ocean Nova! They were our dream team and made this trip a fabulous experience! Special waterproof boots are provided by Antarctica XXI, but warm clothes are not. 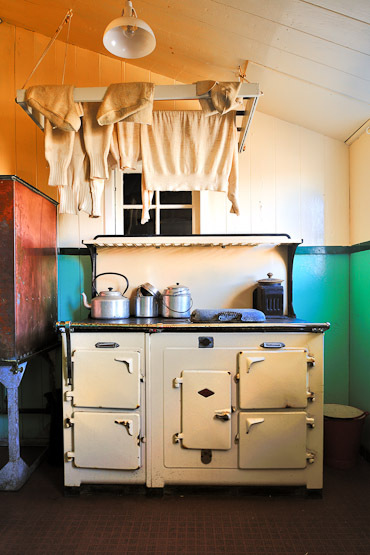 Ideally is to bring water- and windproof outdoors clothes. Patagonia and Canada Goose resist the Artic temperatures and extreme wind.